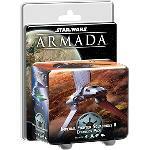 Opis: The Empire’s most advanced attack craft bring monstrous power into battle in the Imperial Fighter Squadrons II Expansion Pack for Star Wars™: Armada. Elusive TIE Phantoms ambush Rebel squadrons, while elite TIE Defenders outmatch the enemy with fearsome capabilities, and hulking VT-49 Decimators leave only wreckage in their wake. Supported by the coordination ability of Lambda-class shuttles, these eight miniature squadrons and eight squadron cards work hard to crush the Rebel opposition.